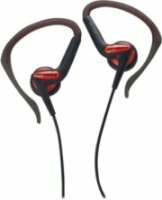 Skull Candy Uprock - Get up, tune in, and rock out with the Skullcandy Uprock Headphones—the latest offering from the headphone gurus that are Skullcandy. This ergonomic and adjustable headphone accommodates to all sizes of domes while the twin 40mm drivers hit hard like an anvil dropping on your cortex. The Uprock is constructed from a blend of lightweight materials that can stand up to adventures of life. The blanket-soft padded ear pillows are comfortable enough to lull you to sleep, assuming you weren't blasting you alt-country/rap/bebop/rock mashup mixes. 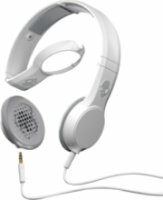 Skull Candy Lowrider Headphones - Skullcandy Lowrider headphones. You always say, "...when we cross that bridge..." Are you referring metaphorically to consumption, the bridge between creation and destruction? If so, you should buy a dozen colors of Lowrider headphones right away. Your wardrobe needs candy paint to match all those sneakers. Don't be slippin'. In-Line Mic1 microphone and remote for iPod/iPhone to make take/make calls and control music. Enhanced 40mm Power Drivers. DJ style rotating earcups. Skull Candy Cassette - Skullcandy Cassette Headphones are loaded with a mic for your calls and big 40mm drivers for full, rich, brain-shaking sound. The Cassette's speakers can be used in Skullcandy's Home Brew Kit hoodies and beanies to blend into what you're wearing. Foldable design fits into included carry bagIncludes thick & soft earpads for general use, and no-slip-silicone pads for active wearRemovable speakers tuck into pockets on hats and hoodiesMic-1 microphone lets you take calls, play/pause the music, control tracks, and works with most smartphonesTravel CaseDetachable cable for mobilitySupreme sound delivers attacking bass, natural vocals, and precision highs..
Skull Candy Hesh 2 Headphones - Skullcandy Hesh 2 headphones. Fisticuffs with the boss could potentially be confused by some at the office as a sign of insubordination. Vigorous dancing on his desk with exotic facial contortions and frequent airborne double-bird fist pumping hand gestures while wearing Hesh headphones is probably a more diplomatic way of saying, "Leave me alone so I can rock again." Soft Leather-Touch Ear Pillows. Includes travel bag. 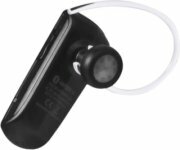 Mic1 remote can take/make calls, play/pause music, and control music tracks with most smartphones. 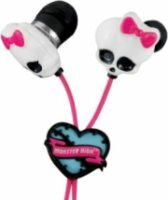 Skull Candy Ink'd 2 Headphones - Skullcandy's Ink'd 2 Headphones are earbuds like none other, the Supreme Sound delivers Natural Vocals, Precision Highs and Attacking bass all while within a lil bud. And when you need to chat it up the mic in the flat cable. Includes several ear tips for a comfy fitInterchangeable gel pads ensure a perfect fit in any earDesigned, engineered, and manufactured by Skull CandySupreme Sound technology delivers attacking bass, natural vocals, and precision highsFlattened cable provides style and better durability. 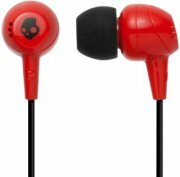 Skull Candy Riot Mic'd - Skullcandy Ink'd Riot special edition earbuds. Ink adds permanence. It forces the visual representation of an idea, concept, ideal or experience, and tangibly commemorates it. Like a tattoo, graffiti, or stretch marks. Until you're really ready to commit, go with the INK'D ear buds. Big sound, little price, no visible scarring. In-Line Mic1 microphone and remote for iPod/iPhone to make take/make calls and control music. Flat cable. Includes 2 silicone gel sizes. 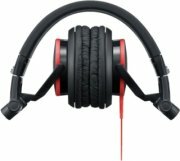 Sony MDR-V55 DJ Style Headphones Black/Red - Listen to music, movies, or games with the ultimate in comfort using DJ-style headphones from Sony. Headband is adjustable for both height and width to provide a perfect fit. Leatherette ear cushions enhance the comfort level of these stylish red and black headphones. 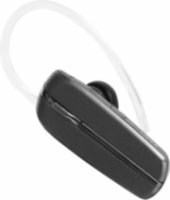 With stereo sound and a 3.5mm plug, they're widely compatible with most audio and video devices.. 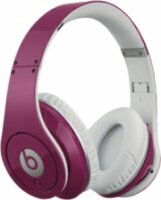 Beats by Dre Mixr Headphones - Neon Pink - World-renowned DJ David Guetta challenged Beats by Dr. Dre to create the perfect set of world-class ear cups. One year and thousands of prototypes later, we’re proud to present one of the lightest, loudest, and most durable headphones ever. Industrial strength sound. Designed to be heard over parties. 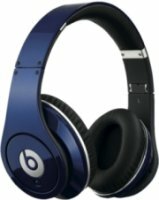 Beats Mixr DJ headphones deliver extremely deep bass at extraordinarily high volume. Made for pros warming up the party. Skull Candy Aviator Headphone With 3 Button Remote - Brown/Gold - Skullcandy’s Aviator headphones blend polycarbonate headphones cups, plush memory foam ear cushions, and premium materials previously only seen in high-fashion eyewear. Even better, they reproduce your music with superior clarity and fidelity. Any mix, any music, any destination—the Aviator delivers Skullcandy’s proprietary Supreme Sound technology with style. Aviator is the ultimate audio experience. Features include a leather carry case, Mic3 in-line mic for making/taking calls, controlling the volume, and playing/pausing tracks. 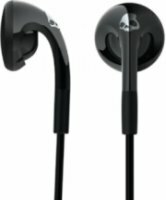 Skull Candy Fix Buds - Skullcandy 50/50 headphones. Meet the unruly 50/50 bud, a composite earphone that's half mic, half bud, and all boom. With superb fit and a beastly 11mm driver, the 50/50 pumps bass deeper than your bag of kickflip variables, and sounds richer than your dirty uncle. And unlike a sketchy 50/50 varial heel-flip, our 50/50 polycarbonate backside mashes the aluminum frontside in perfect symmetry. The Skullcandy 50/50: composite bud, killer odds. 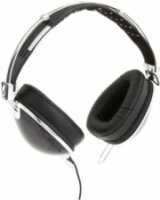 Skull Candy RocNation Aviator Headphones - Skullcandy Roc Nation Aviator headphones. In order to get the job done, we had to bring in the top gun, the Aviator. Engineered optics for your ears. Tactical precision and design... Stay fly. Platinum sound performance. Ideal contour fit. Optics-inspired polycarbonate speaker housing. Premium polished surface. Stashable travel design. Stainless steel, aluminum, polycarbonate. In-Line Mic3 microphone and remote for iPod/iPhone to make take/make calls and control music/volume. Imported. Speaker diameter: 40mm. 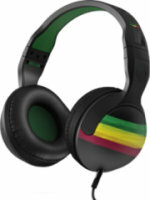 House of Marley Liberate - House of Marley Liberate on-ear headphones. Liberate on-ear headphones offer a unique design crafted from stainless steel, fabric and FSC certified wood. 40mm high performance drivers deliver every ounce of energy and every subtle detail with our Marley signature sound. Sound Signature: Every Marley product is engineered to deliver all genres of music to the listener with as much energy, emotion, inflection, nuance and attitude as the original performance.3 button remote with mic: compatible with iPhone, iPad, iPod, and other smartphones.